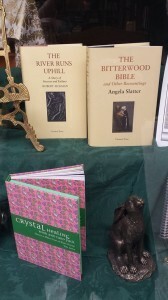 The lovely Lily Childs sent me this photo, showing Bitterwood in the window of the Atlantis Occult Bookshop near the British Museum. It’s cuddling up to another gorgeous Tartarus Press production, Robert Aickman’s The River Runs Uphill. So, my baby is in excellent company! This entry was posted in News and tagged Atlantis Occult Booshop, Lily Childs, Robert Aickman's The River Runs Uphill, tartarus press, the bitterwood bible and other recountings. Bookmark the permalink.